Another great story here; and another funny connection twist. At the time that I visited with my cousin, who I mentioned in my last post, it so happens that he was playing for the Devil Rays. It was so much fun for me too, to be able to meet Mike’s teammates and to hang out with their families in the stands, for a whole week. Such great memories! Can’t wait to read your next entry, and to hear the new music you’re workin’ on! Whats up Mark! My name is Nick Zilan and im from the Detroit area. Sounds like you have a pretty normal life! haha! i will keep on reading your entries they are intresting. Come back to detroit and play a show again soon! Hey Mark! Juts signed up for this thing so I could read up on your blogs. Hope everything is going good with you and your wife and your son. I know you’ll make a good father. I guess I need to be a baseball star or a rockstar soon so next time I come down to Orlando, I can call you up and meet up with you!! Come back to DC for another show at the 9:30 Club soon PLEASE!! I’m glad you had a wonderful time at the game. I really enjoyed reading your blog. Like jimithing96 said, AB has got to come back to the 9:30 Club in D.C.! that was my first time seeing you perform and it was off the hook! Until next time. the Boston shows were the absolute best!! 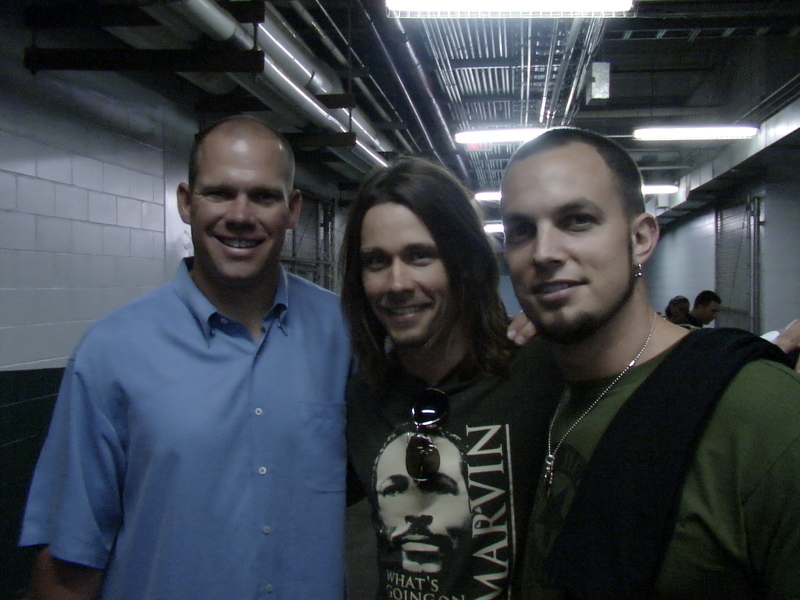 i was there for both shows… the 1st time around Myles took my Red Sox visor (does he still have it?) and the 2nd time around i met all of you guys. Meeting you guys was a blast and an honor. You truly are rock legends. Mike, from Boston. Cowboy Up! My brother, David Wall, died and at his funeral we played his favorite song. It was a song by creed. He had a little girl and I got temporay custody of her then he died. He was a twin and before his death his wife left him and social services was after her because of her drug abuse problems. My brother loved her and his little girl with all of his heart. He played that song over and over crying wanting his life back with his little girl and his wife but it didn’t happen. He was 26 yrs old, a twin, and my baby brother. The song was “With Arms Open Wide”. I had a near death experience a couple of years later, and I saw David with Jesus in Heaven. It was so awesome I didn’t want to come back, but Jesus showed me that I needed to. I just wanted to let the band know that their music has touched many people. David was a born again Christian, and he loved and amired your music. It has taken me this long to write you and tell you all of this due to the deep emotional baggage I have had to carry. When you sing and write songs think about the people that listen to it. Like my brother David, he didn’t have much, but what he did have was his little girl. She was only 3yrs old when her father died, and she listens to that song over and over because she knows it was his favorite. She listens to it so that she can be close to her dad it is the only was she knows how at her young age but she tries. When I listen to it I cry my heart out because I remember his heartach and his loneliness. It has taken me a long time to be able to listen to it all the way through without braking down. God puts music in your hearts and minds so please allow the Holy Spirit to use you all to His Glory. You never know how much impact you have until the end. May God Bless you and Your Band. Hey Mark! I can’t tell you how excited I was to see you at the Home Run Derby and the Heroes and Legends game (so lucky). My appreciation for you skyrocketed when I found out you were a baseball fan. I’m from Spokane (Go Myles Kennedy!) and think you guys should come back soon! Without Scott Stapp, this town loves you guys! Come back soon! What’s Up,Man?Loved the article as usual.Fair play to you dude for letting Grimsley his Misses and their kids over to your Isleworth place on such short notice but then again I wouldnt mind if a legend like Grimsley rang me up and asked could he stay in my pad, that guy is a living legend(much like yourself)!You seem to be visiting a lot of Devil Ray games recently, i hope you havent changed your alleigance to mediocre Tampa? !I’m an Orlando resident myself and I just don’t get that team,it really needs to be shaken up next season.Anyway, congratulations to yourself and your wife with your new born.Keep up the good work on and off the stage…oh and I hope to hear lots of sweeps on the new record and maybe even a whole instrumental song by you.Rock on man. hoping you would jack one like you do when u step on the stage. Heard Stapp gave an interview and said the breakup of Creed was mutual and that you both left it open for any projects in the distant future? Is this true, so many people portray you and Stapp as being at war. ur a great inspiration to me to play guitar but i dont like the way u handle things unforutally i missed the creed concert in Australia i guess i would like to see them maybe this is the reason why i am saying this but also the reason is u had such a good thing with creed ….. ever singer with a high voice like stapp eg( hinder n dotary whatevea its called) radio stations say oh this band is like creed and *** they cant even hit good notes or cant make magic like creed did (my own prison human clay then to finish it off weathered ) bands these days need 5 albums to get recognized all i can say weather u give a **** or not work ur problems out in the end u might feel better and u will be the better man in all this, if stapp dosent try to work things out u should be a man and take reasonability to fix it…..